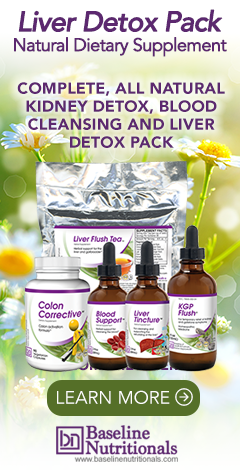 Note: It is vital that you do a colon detox before doing the liver detox. When the liver dumps, it dumps through the bile duct and out into the colon. If the colon (the drain pipe if you will) is plugged, the waste backs up into the bloodstream and can make you feel extremely ill. This is the reason that the "Miracle Doctors" always start with the colon detox. It's the prerequisite for all the other cleanses in the body -- and, of course, can also produce dramatic healings in its own right. And this is where the Liver Tincture™ comes into play, as described in our "Products Needed" page. Whereas the Liver Flush Tea™ is primarily a therapeutic cleansing and "easing" formula, the Liver Tincture™ is essentially a medicinal rebuilding and anti-parasitic formula designed to be used on an as needed basis. Listen to the audio files, download the daily diet chart, and make sure you have all ingredients before you start! If you start to have a detox reaction and can't make it, stop, and try again later. But if you can make it through, keep going because this detox is by far the most powerful, cleansing detox you can find in the world. And, it can be done from the comfort of your own home. For those who don't want to do the full liver flush that involves a 3 or 5 day fast, there is a slow and easy version that will give you 70-80% of the benefit without the difficulty. As part of your daily diet, just eat one cup of freshly grated beets mixed with olive oil and lemon juice for 30 days straight. Mix whatever amounts of olive oil and lemon juice make a satisfactory dressing for you. 50/50 works. You can add fresh garlic for additional flavor if you want. Daily use of the Liver Flush Tea is required and one bottle of Liver Tincture is highly recommended. However much you want to use as long as you finish the bottles in anywhere from 5-30 days. Liver tea, one to two cups a day.